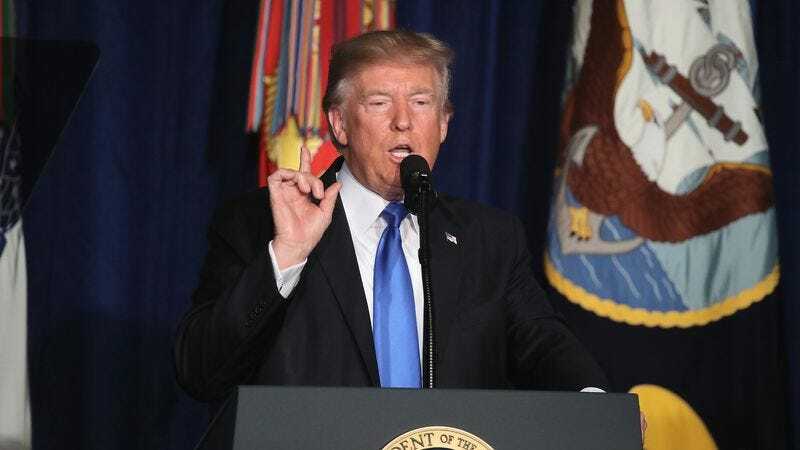 ARLINGTON, VA—Saying the United States owed nothing less to future generations, President Trump vowed during a televised speech Monday night to leave a better Afghanistan for the nation’s grandchildren to fight in. “All our efforts are focused on creating and preserving an Afghanistan that we can be proud to pass down to the men and women in uniform who’ve yet to be born,” said Trump, adding that the administration will work tirelessly to ensure that, decades from now, American troops will be fighting in a more sustainable conflict alongside a restored Afghan National Army. “Rest assured that you will be able to look into your children’s eyes and know that their children and their children’s children will be conducting military operations in a country that’s far more stable than it once was.” Trump went on to say that with the right forward-thinking policy, American soldiers could thrive in Afghanistan indefinitely.